As we enter the end of January many folks are just getting around to opening their 4th quarter statements. In most of those cases I wouldn’t expect smiles on many faces. The 4th quarter of 2018 saw what was once an S&P 500 in positive territory, decline sharply and end the year down 4.4%. In addition to that, international markets, both developed and emerging, spent most of the year in negative territory and finished the year in negative territory. If you expected help from the fixed income portion of your portfolio, that wasn’t much help either. The Barclays US aggregate Index spent much of the year in negative territory before settling around even at year end. There were a number of reasons that led to the year that was (We will save that for a separate post!) 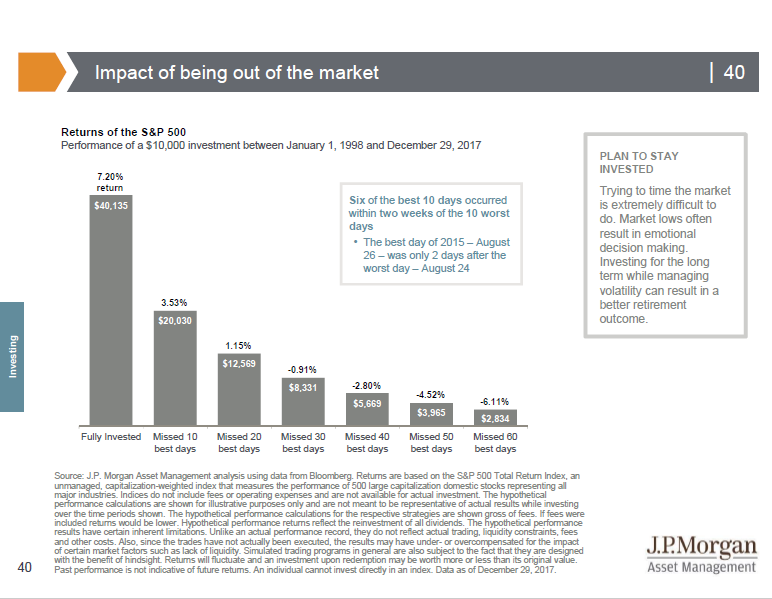 but I believe the 4th quarter of 2018 and the opening weeks of 2019 have been a great reminder to both us and our clients as to why we stay invested during periods of volatility. In the midst of that sharp decline in the 4th quarter we saw the largest one day point bounce in Dow Jones history on December 26th. After 7 consecutive negative trading days the Dow suddenly rose 1,086 points. For people that moved to the safety of cash out of fear they missed that opportunity. Through January 30th the S&P 500, MSCI EAFE and MSCI EME have all stayed in positive territory. Having a plan and sticking to that plan is the first ingredient for successful investing. Volatility in the markets is a fact of life and something that needs to be accepted and expected as part of the journey to the end game of your own personal plan. Trying to time when an index will suddenly jump in a historic 1 day gain after a losing streak is even harder. Take a look at the attached chart to see just how detrimental it can be to attempt to time markets. Once you have picked an investment strategy, stay the course. Understand that volatility will be a part of that journey but be sure to talk to your advisor during those tough times to get a reminder of your long term goals. That doesn't mean adjustments shouldn't be made to your plan along the way. After all, life changes constantly. We strive to be there for you during those changes, but particularly when we go through rough times such as what we saw in the 4th quarter. Ultimately, open dialogue between advisors and our clients is the best way to continue along your journey of financial success. Together we will define what your wealth is worth.